Stone Coffee Table by Odesi & Kees Marcelis-Modern Display of Skill | Homesthetics - Inspiring ideas for your home. “The Stone came to life from a sketch I had in my sketchbook, but of which nothing had been made. I always thought this would be an exciting design.Eventually, it became this coffee table that I worked on with Odesi. One Stone is characterized by peace and tranquility. Passive and motionless in itself. By placing more of them together something special happens. What was empty space at first, now form a dynamic lines. The different ways to look at the Stone makes it all the more interesting. Sometimes you design an object that you keep on wanting to look at it, and this is one of these objects. 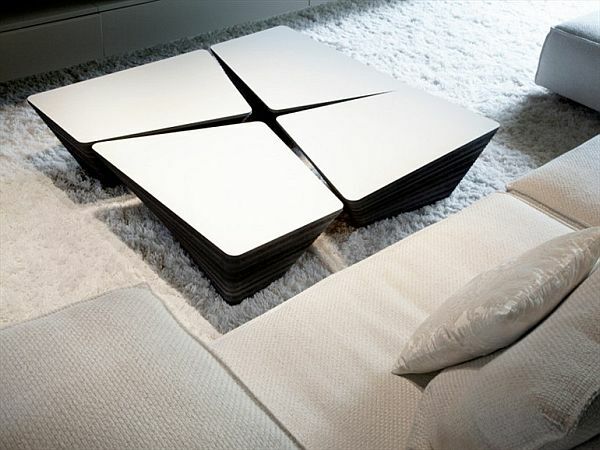 The Stone coffee table is made out of four separate but identical pieces. Each single piece is asymmetric, but all the pieces together create a whole. 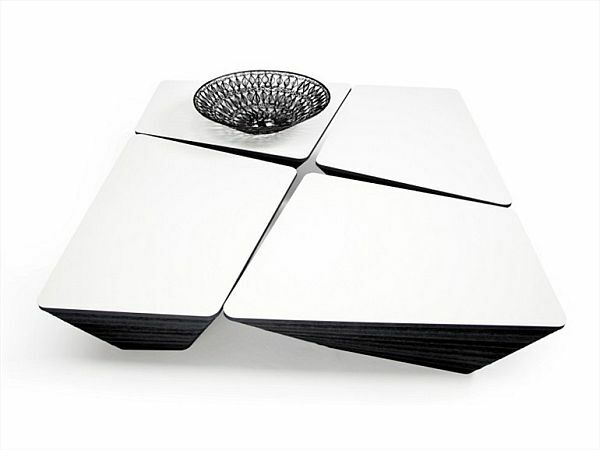 The Stone is a modern coffee table which can be used in various ways. The separate parts can be used to create smaller or bigger tables. Depending on the space and company you are able to combine pieces for the best configuration. You could use a single piece as a side table or create two table’s consisting of two pieces each. The edges are specially tooled to provide them with a rough surface which has a quality feeling. Because of this, the antracite coloring also has more depth to it. 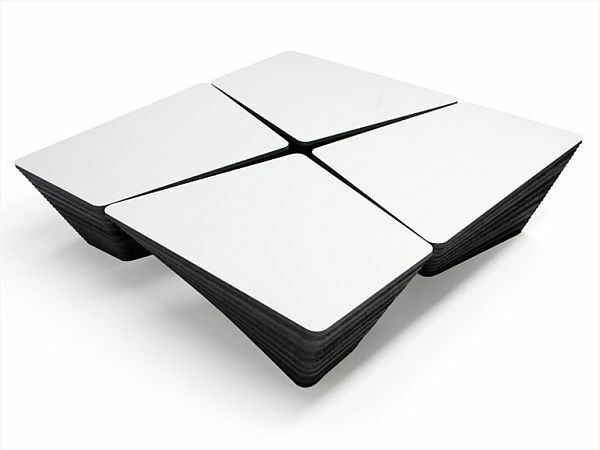 The tabletop is made to be very durable in daily usage. We have chosen a material that is insusceptible to liquids, temperature or discoloration.The Stone is a true piece of design but one which you can also really use. This table is resistent to marks, scratches and stains. Drinking glasses, hot cups of coffee or tea can be placed on the table without worrying. Most contemporary designs are defined by their center pieces, even if that center piece is sadly your TV. The furniture is gravitating around that center piece and is obviously oriented towards it. This particular piece of furniture presented above, in a minimalist interior can recall this role or spread into four smaller pieces which can either sustain the centerpiece or contradict it. This highly adaptable item exudes personality in any form or role, motive for which we tend to support it and appreciate it.